We look forward to the arrival of all our guests. If you come with your furry friend, you can rest assured that they are welcome and will surely have a great time here on the Crikvenica Riviera. To start with, choose accommodation in one of our pet-friendly apartments or hotels. After that, you can enjoy pleasant walks by the sea or in the quiet wooded hinterland nearby. The dog beach in the small harbour of Podvorska in Crikvenica guarantees loads of fun. If you didn’t already know, this is one of the best dog beaches in Croatia, fully dedicated to your pets, who can take a shower after swimming in the sea and even have a beer in the bar. Yes that’s correct, the Podvorska beach with the Monty’s Dog Beach & Bar in Crikvenica is the first bar of its kind in Croatia that offers beer, ice cream, cakes and teas for your dogs. If required, you can also find a veterinarian for your pet on our Riviera. 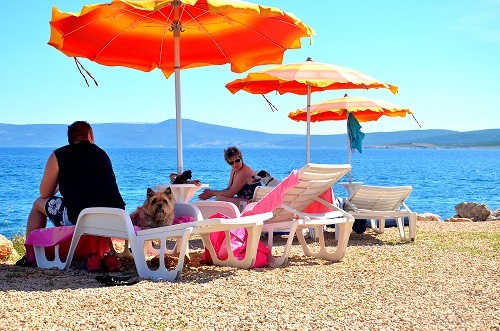 See for yourself why Crikvenica is a pet friendly destination! There is also an event dedicated to our four-legged friends and includes a pet product fair, a presentation of skills and training techniques, and even a pet carnival. The event, which took place for the first time last year, won the ‘Simply the Best’ national award for the best innovative project in tourism. We look forward to welcoming you to dog-friendly Riviera in Crikvenica!